MADesigns has recently released the International Men Collection with over 30 new shapes from different countries and territories around the world. Created by Kirk Claymore, this new collection highlights the combination of diversity and style. Each shape includes hair, eyes and styling card. TAKE THE INTERNATIONAL MEN CHALLENGE and you can win as much as 45,000L worth of prizes by simply naming 20 countries represented in the new International Men Collection featured at the KMADD store. A 8,192 sq. ft parcel in the beautiful Costa Rica Sims with 1,875 prims valued at 35,000L$ with 1 month of tier included. New York City style lofts and skyboxes. To claim your prize, please contact Maddox Dupont. It’s time to check your Vexillology (the study of flags) skills! MADesigns International Men Collection has recently released new shapes representing a number of countries from the Middle East, North Africa and Western Asia. Twenty Two (22) new shapes are on display at the MADesigns Store lobby. 8,192 sq. ft. with 1,875 prims valued at 35,000L$ with 1 month of tier included. 1. 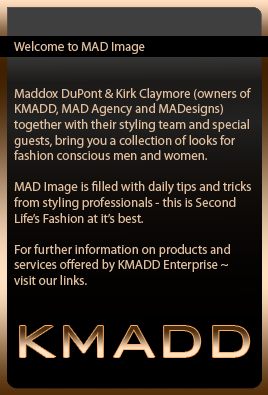 To be eligible, you must be a member of the KMADD Enterprise Group. 2. MADesigns Store must be in your picks tab. 3. Your account birth date should be dated on or before January 15th 2009. 4. All entries must be completed correctly and received on or by the closing date/time. No purchase necessary to enter or win. 5. Only one (1) entry per avatar. 6. Name the twenty two (22) countries (in ALPHABETICAL ORDER) represented in the new International Men Collection shapes found on display at the MADesigns Store lobby. Put your answers in a notecard and drop it in a designated RED drop box near the display. Don’t forget to label your notecard with your complete name. Entries with no names will be disqualified. There is NO FEE to enter the contest. Do not drop notecards to Kirk Claymore, Maddox Dupont, Risa Bright or any staff of KMADD, such entries will not be honored and will be automatically disqualified. All entries must be submitted on or before Saturday, February 28 2009 at 12:00 noon slt. No exceptions. 7. The prize(s) that may be awarded to the eligible winner(s) are NOT transferable, redeemable for cash or exchangeable for any other prize(s). If a winner cannot be contacted or is disqualified for any reason, KMADD reserves the right to determine an alternate winner in its sole discretion. 8. Names of winners will be posted in the MAD Image blog, KMADDCITY.com and KMADD Enterprise group notice on February 29, 2008. 9. By entering the contest, you agree to be bound by these rules. Contestants further agree to be bound by the decisions of the contest providers, which shall be final and binding in all respects. Contest providers reserve the right at their sole discretion to disqualify any individual they find to be acting in violation of the contest rules.